Agriculture as one of the critical sectors for Indonesia's economic growth has not contributed to the welfare of farmers. The fundamental problem of low farmer's income related to their spirit entrepreneurship in farming. This article describes the entrepreneurship passion of farmer and its relation to flood and avalanche risk protection efforts. This study used the descriptive quantitative approach with a total sample of 70 farmers who manage the land on the banks of the river. There are three kinds of analysis tools: descriptive quantitative, comparative analysis of t-test method and correlation analysis by ANOVA test. The results show that the entrepreneurship passion of farmers is focused on production cost, income, and asset protection. While the spirit of the farmers for risk protection is still low. As a result, river bank management is considered less support for their entrepreneurship passion. The research also resulted that the characteristic of farmers does not affect the entrepreneurship passion. Asset Protection, Farmer Characteristic, Production Cost, Risk Protection. The role of the agricultural sector in Indonesia is undoubted and contributes significantly to the growth of the national economy. Data for 2017 showed that 31.86% of Indonesians work as farmers. Furthermore, on the revenue side, the data shows that farmers' income in Indonesia is an average of Rp. 1 million or $71.73 per month. Farmer earning value is relatively lower than other economic activity actors. The cause of low income is related to the microeconomics of the agricultural system in Indonesia such as the unstable production operating costs, natural disaster risk and unstable grain prices. Traditional agricultural systems and uneconomical agricultural patterns are a fact of agricultural activity in Indonesia. Most of the villagers working as farmers unconsidered that their activity as an entrepreneur. The concept of entrepreneurship in farmers still does not affect the advanced agricultural system (Mellor, 1969). Consequently, the farmers' consumptive life pattern causes difficulties to develop their business. The pattern is visible at the harvest ceremony, folk party or various other cultural heritage rituals (Altieri, 2004). Most farmers do not understand about venture capital in the form of money but only assume that land is the primary model. The improvement effort the living standards of farmers in Indonesia is focussed on developing an entrepreneurial spirit in managing land. Agricultural activities as the utilization of the potential of land resources and human resources require management with an entrepreneurial approach. Entrepreneurial spirit encourages farmers to be creative in dealing with issues of either nature or non-natural. The role of farmers as managers and at the same time as labor is faced with various choices in making decisions. Choice of technology-related strategies, budget allocation and utilization of human resources is an entrepreneurial mindset. The entrepreneurship passion of farmers will contribute to develop innovations that can increase the crop production (Carlos & Sampaio de Sá, 2014; McElwee, 2006; Yuan et al., 2017). Farmers who manage land on the riverbank have a high opportunity of crop production related to land fertility. On the other hand, they also have a risk of crop failure due to flood and the risk of losing assets due to avalanche (Lullulangi et al., 2014; Rahman, 2010). Therefore, the opportunity and risk conditions require the selection of strategies and the development of riverbank management innovations. The evidence of low riverbank management activities is a clue concerning the low awareness of farmers on the impact of land quality on their income. Entrepreneurship education for farmers is an important part of efforts to improve welfare. Thus, this paper reviews the relationship between the entrepreneurial spirits of farmers in managing land on the riverbanks. To examine the issue of farmer's courage in determining farming strategy, the researcher undertakes the following study steps: Firstly, we introduce the literature on entrepreneurship passion and riverbank management to define the indicators of variables. Secondly, the researcher describes the research methodology and the results. Finally, the discussion about research findings and policy implications for the government to empower farmers through entrepreneurship education. Asset management activities by farmers are carried out in groups. Farmer innovations to protect assets and optimize crop production are developed with the networks formed between them. Equality of enthusiasm encourages the formation of networking for achieving goals. The network can take formally and informally and contribute to land management activities. Formal institutions facilitate the implementation of empowerment by the government while non-formal institutions are the connector between farmers in sharing their knowledge and innovation. (Pittaway et al., 2004). The networking is a form of social enterprise that requires an entrepreneurial spirit for farmers. This is an important part in building entrepreneurship education for farmers (Pittaway & Cope, 2007). Moreover, the effort builds social economic potential for farmers based on three types of motivation, namely financial motivation (efforts to increase crop production), social motivation (efforts to build networks) and material motivation (efforts to protect land assets) (Centobelli et al., 2016). The entrepreneurship passion is the spirit or thought of a person in producing services or products, the selection of strategies in the face of competition and social mission. This spirit helps to connect between cognitive ability and entrepreneurial behavior in achieving optimal results (Cardon & Glauser, 2011; Warnick et al., 2018). Particularly, the importance of entrepreneurship passion for farmers serves in the development of internal potential or profit achievement. Previous studies have revealed that Entrepreneurship affects agricultural performance and productivity through either technical and biological processes or management capacity. Furthermore, farmer-entrepreneurs are characteristic indicated by knowledge about technology and productivity, innovation, openness for their mind and ambition to find the maximal production (Darmadji & Suwarta, 2018; Farmer & Kung-Mcintyre, 2008; Razafimanantosoa et al., 2006). Cultivation activities encourage farmers to maintain the quality of land, Indicators entrepreneurship passion by farming operations are presented in Table 1. Aspects that affect a person to expand resources (Leung et al., 2006) The farmer's desire to expand the land, to use superior seeds and to increase labor. Management of venture growth (Lee & Tsang, 2001) The spirit of farmers to maintain the land area, the quality of land and the quality of agricultural machinery. The financing decision for production cost (Kourilsky & Walstad, 1998; Dean & McMullen, 2007) Farmers' consideration in investing the cost of protecting land. The financing decision for risk protection (Piperopoulos & Dimov, 2015) Farmers’ consideration to face the risk of floods and landslides. Riverbank management is one of environmental protection to maintain the asset from flood and landslide hazards. The effort requires a considerable investment of funds, time, technology and labor. So that, the farmers’ decision is based on their passion to entrepreneur. Land protection against the flood will reduce the risk of crop failure which affects productivity. Farmers with high anxiety about flood risk and crop failure will protect their land. Moreover, protection of river banks is also known as prevention of land collapse. The landslide collapse would affect the loss of property or the primary asset in agricultural activity. Soil protection activities or business capital grew due to the fear of farmers losing assets. The entrepreneurship passion conceptually is emerged as feelings and emotional energy. For farmers with a high sense of anxiety practically participate in protecting the land even with high capital investment costs. Many farmers have been constructing the river embankment to protect their land on the river banks. The other hand, they also preserve the trees on the riverbank as land erosion prevention. The efforts require such farmers' sacrifices as material costs and labor costs. While the choice of tree planting in riverbank impacted on the lack of land area cultivated (Baum et al., 2001; Bird, 1992). This study used a quantitative approach that includes three variables, namely the characteristics of farmers, entrepreneurship passion, and management of river banks. The sample was 70 farmers selected by incidental sampling method. The farmers as research subjects have cultivating experience for ten years. Methods of data collection using questionnaires consisting of a number of statements containing information about the research variables and using a Likert scale to enable statistical methods (Bradburn et al., 1979). Researchers recapitulated respondents' answers to the questionnaire for the easer analysis. Comparative analysis to examine differences in entrepreneurship passion on various characteristics of farmers is done by the t-test (Smart & Conant, 1994). Furthermore, the relationship between two variables was analyzed by ANOVA test to get the relationship between variables (Smart & Conant, 1994). Both statistical analyzes are supported by SPSS software. Personal characteristic is one of the factors in deciding strategies. One's entrepreneurial performance is the result of a combination of individual elements and other external factors (Carlos & Sampaio de Sá, 2014). The personal characteristics of the entrepreneur are characterized by their education, land ownership, and their cultivation pattern (Table 2). Table 2 shows that most farmers are graduating from Senior High School. Furthermore, farmers are not currently a landowner but only as land managers. This reason is the basis for developing knowledge for farmers. In many developing countries, farmers are adopting new technologies for their production processes that require basic knowledge (Panda, 2015). As a land manager, farmers must also have a passion for developing the product or in general must have entrepreneurship passion. The entrepreneurship passion of farmer is divided into four indicators and shown in Figure 1. Figure 1 shows that farmers generally have a good passion for three indicators. Nevertheless, many farmers have a poor understanding about the risk prevention. The average value of entrepreneurship passion is 3.12 or with the highest category. The highest intensity of farmers in cultivation activities is minimizing production costs, and the lowest is risk management. The previous study outlining the cost of producing agricultural activities is the technology and resources. Agrarian technology includes agrarian tools, external input such as fertilizers and pesticides. Resources include the amount of labor used during the planting period until the sale of crops. (Sgroi et al., 2015). 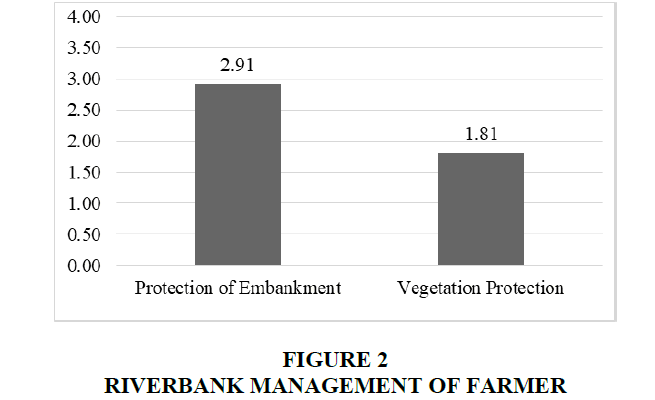 Riverbank management by farmers is divided into two behaviors described in Figure 2. The farmers on the banks of the river usually protect their land by structuring embankment. While the protection of vegetation was less attention to them. Farmers with high passion will attempt to estrange their land from flood and erosion. Such protection efforts by strengthening the cliff structurally. But vegetation protection efforts have not been made optimally. Statistical analysis to see the difference in entrepreneurship passion on various characteristics of respondents is presented in Table 3. H0=There is a difference in entrepreneurship passion of low educated farmers and high educated peasants. Sig<0.05 0.621 H1=No difference in entrepreneurship passion of low educated farmers and high educated peasants. H0=There is a difference in the entrepreneurship passion of the farmer as landowners and the farmers as the cultivator. Sig<0.05 0.062 H1=No difference of the entrepreneurship passion of the farmer as landowners and the farmers as the cultivator. Ho=There is a difference in the entrepreneurship passion of the paddy field farmers and farm field farmers. Sig<0.05 0.089 H1=No difference in the entrepreneurship passion of the paddy field farmers and farm field farmers. The results showed that there were no differences in entrepreneurship passion of farmers with different education levels, different land ownership, and different cultivation patterns. This analysis indicated that the characteristics of farmers do not affect the enthusiasm of farmers to develop entrepreneurship in farming. Furthermore, ANOVA test results (Table 4) show that the sig value is 0.054 or greater than 0.05. The analysis indicated that there is no influence of entrepreneurship passion of farmers on their effort regarding bank river management. The farmers generally conducted bank river as asset protection and not related to efforts to enhance harvest or risk management. The results showed that risk management on the riverbank was not based on entrepreneurship passion. Farmers generally judge that risk is unavoidable and takes place naturally. The reason for the low level of land protection; first, planting trees on river banks is not considered to contribute to increased yields. In general, farmers spend most of their time and capital on plant maintenance. Second, disaster risk protection in an area is the responsibility of the government. Therefore, farmers' attention to risk protection is very small. This study is an important part for local governments in determining riverbank maintenance strategies based on the ability of farmers' entrepreneurship. Furthermore, this study does not discuss the social potential of farmer’s collectively. The variables only represented the personal characteristics and have not revealed innovations that can grow positively with this potential. Entrepreneurial education is important for farmers to develop innovation in the protection of land assets with river bank management. Social entrepreneurship will spread to the farming community with financial benefits (Sullivan et al., 2003). The ability to determine an asset protection strategy will contribute to improving its welfare. With this capacity, the entrepreneur's passion will be a great social capital in improving welfare and improving the quality of the environment (Centobelli et al., 2016). Local governments can contribute to the development of social capital by optimizing formal networks intensively and building food production networking. The conclusion of this study that most farmers have entrepreneurship passion by considering production cost, income, and asset protection. This passion caused farmers to make an embankment as asset protection. Otherwise, river bank management by tree planting is considered less supporting for their entrepreneurship passion. The research also resulted that the characteristic of farmers does not affect the entrepreneurship passion. The authors have an idea to develop the community empowerment model as farmer capacity models by exploiting the potential of entrepreneurship both personally and institutionally. This research is supported by the National Strategy Research Program (Nasional Strategy) 2018 from Research and Community Service Directorate of The Ministry of Research and Technology for Higher Education, Republic of Indonesia. We also want to thank all for Local Government of Soppeng Regency for its willingness to facilitate this research activity. Altieri, M.A. (2004). Linking ecologists and traditional farmers in the search for sustainable agriculture. Frontiers in Ecology and the Environment, 2(1), 35-42. Baum, J.R., Locke, E.A., & Smith, K.G. (2001). A multidimensional model of venture growth. Academy of Management Journal, 44(2), 292-303. Bird, B.J. (1992). The operation of intentions in time: The emergence of the new venture. Entrepreneurship Theory and Practice, 17(1), 11-20. Bradburn, N.M., Sudman, S., Blair, E., Locander, W., Miles, C., Singer, E., & Stocking, C. (1979). Improving interview method and questionnaire design: Response effects to threatening questions in survey research. Jossey-Bass San Francisco. Cardon M.S., & Glauser, M. (2011). Entrepreneurial passion: Sources and sustenance. Carlos P.J., & Sampaio de Sá, E. (2014). Personal characteristics, business relationships and entrepreneurial performance: Some empirical evidence. Journal of Small Business and Enterprise Development, 21(2), 284-300. Centobelli, P., Cerchione, R., Esposito, E., & Raffa, M. (2016). The revolution of crowdfunding in social knowledge economy: literature review and identification of business models. Advanced Science Letters, 22(5-6), 1666-1669. Darmadji, D., & Suwarta, S. (2018). The testing of entrepreneurship as the attempt to remodel the factor of production in the rice farming. Journal of Socioeconomics and Development, 1(1). Dean, T.J., & McMullen, J.S. (2007). Toward a theory of sustainable entrepreneurship: Reducing environmental degradation through entrepreneurial action. Journal of Business Venturing, 22(1), 50-76. Farmer, S.M., & Kung-Mcintyre, K. (2008). Entrepreneur role prototypes and role identity in the US, China, and Taiwan. In Academy of Management Proceedings (pp. 1-6). Academy of Management Briarcliff Manor, NY. Kourilsky, M.L., & Walstad, W.B. (1998). Entrepreneurship and female youth: Knowledge, attitudes, gender differences, and educational practices. Journal of Business Venturing, 13(1), 77-88. Lee, D.Y., & Tsang, E.W.K. (2001). The effects of entrepreneurial personality, background and network activities on venture growth. Journal of Management Studies, 38(4), 583-602. Leung, A., Zhang, J., Wong, P.K., & Der Foo, M. (2006). The use of networks in human resource acquisition for entrepreneurial firms: Multiple “fit” considerations. Journal of Business Venturing, 21(5), 664-686. Lullulangi, M., Ardi, M., Pertiwi, N., Bakhrani, R., & Dirawan, G. (2014). Subjective norms adopted by the local community in preserving environment of settlement in the watershed, Mamasa. Journal of Environmental Science and Technology, 7(5), 305-313. McElwee, G. (2006). The enterprising farmer: A review of entrepreneurship in agriculture. Royal Agricultural Society of England Journal, 167, 66-75. Mellor, J.W. (1969). The subsistence farmer in traditional economies. Subsistence Agriculture and Economic Development, 209-227. Panda, S. (2015). Farmer education and household agricultural income in rural India. International Journal of Social Economics, 42(6), 514-529. Piperopoulos, P., & Dimov, D. (2015). Burst bubbles or build steam? Entrepreneurship education, entrepreneurial self?efficacy, and entrepreneurial intentions. Journal of Small Business Management, 53(4), 970-985. Pittaway, L., Robertson, M., Munir, K., Denyer, D., & Neely, A. (2004). Networking and innovation: A systematic review of the evidence. International Journal of Management Reviews, 5(3?4), 137-168. Rahman, M.R. (2010). Impact of riverbank erosion hazard in the Jamuna floodplain areas in Bangladesh. Journal of Science Foundation, 8(1-2), 55-65. Razafimanantosoa, T., Ravoahangimalala, O.R., & Craig, C.L. (2006). Indigenous silk moth farming as a means to support Ranomafana National Park. Madagascar Conservation & Development, 1(1). Sgroi, F., Candela, M., Di Trapani, A.M., Foderà, M., Squatrito, R., Testa, R., & Tudisca, S. (2015). Economic and financial comparison between organic and conventional farming in sicilian lemon orchards. Sustainability, 7(1), 947-961. Smart, D.T., & Conant, J.S. (1994). Entrepreneurial orientation, distinctive marketing competencies and organizational performance. Journal of Applied Business Research, 10, 28. Sullivan M.G., Weerawardena, J. & Carnegie, K. (2003). Social entrepreneurship: Towards conceptualisation. International Journal of Nonprofit and Voluntary Sector Marketing, 8(1), 76-88. Warnick, B.J., Murnieks, C.Y., McMullen, J.S., & Brooks, W.T. (2018). Passion for entrepreneurship or passion for the product? A conjoint analysis of angel and VC decision-making. Journal of Business Venturing, 33(3), 315-332. Yuan, P., Liu, Y., Ju, F., & Li, X. (2017). A Study on Farmers’ Agriculture related Tourism Entrepreneurship Behavior. Procedia Computer Science, 122, 743-750.